I am the 2nd owner of this Tacoma. The previous owner did several upgrades to it and a couple of them I even like. 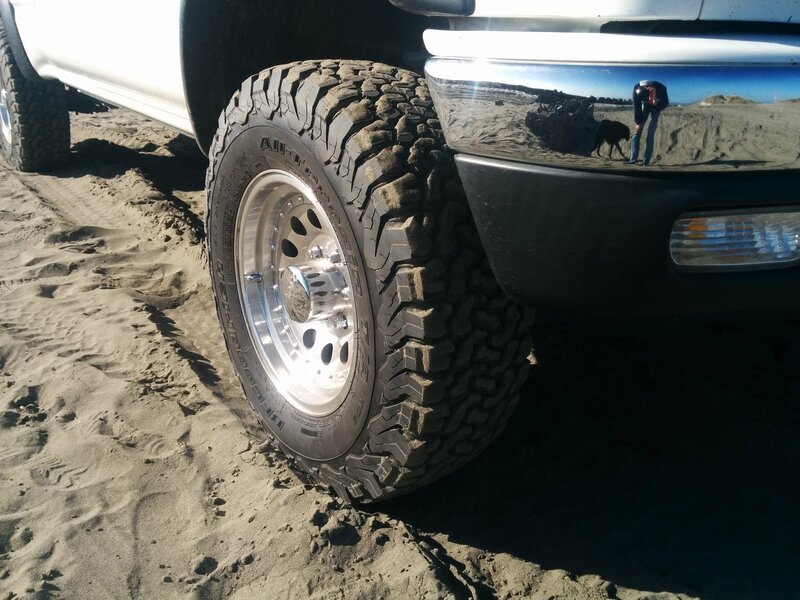 One that was not to my liking was his change to 15×12 wheels with substantially larger than stock Mickey Thompson Baja MTZ 33×12.50R15LT (318/72/15). While certainly fun and cushy off-road they had their drawbacks. They were noisy, they rubbed in several places front and rear when doing certain maneuvers and, to put it lightly, my gas mileage sucked (about 15.8 mpg). So, I decided to go back to its factory size of 265/70R-16. I have the original BFGoodrich All-Terrain KOs on my FJ55 Land Cruiser so decided to stick with what I know and get the updated version. Now sometimes I get excited about something and, after a little research, if it sounds good, I’ll get it. That’s what I did with these. Incredibly, when these wheels and tires showed up they were inflated to 74psi…and they’re rated for 80psi max! For the first few minutes of the test drive on a nice, smooth piece of road they were awesome; smooth, quiet (coming from Mickey Thompson Mud Terrains ANYthing would be quieter, except maybe Super Swampers), with crisp turn-in and handling. And then I hit a pothole and was almost shaken out of my seat. Like a cement truck riding on iron shod wagon wheels. A few forum posts later I found my new normal of 48psi cold, which gets up into the low to mid-50’s warm, max. Don’t get me wrong, they have so far met my expectations and taken us both into and back out of some challenging places and situations. What I didn’t factor into the buying decision was Load Factor. I didn’t even know what it was. If it fits it should work…right? Well now I know about Load Factor and these tires are more than the Tacoma needs. I needed C and these are E. That means they are heavier than ideal. Apparently just two tires have the ability to handle the weight of the entire Tacoma. That’s not including the shell and everything on it and in it but that only adds another 1000 pounds or so. Hopefully that also means they can handle more than I can dish out so I expect them to last a good long time. As for as the two main reason I got them…they are amazingly quiet compared to the Mickey Thompsons and my mileage went up into the mid-to-high 17’s and that does include the shell and extra 1000 lbs of stuff we regularly carry. UPDATE: Now that we have the new Old Man Emu lift on I can see that we could handle tires bigger than normal. I still have the old Pacer wheels and Mickey Thompson tires and so might slap them back on for another round just to see if that size fits under the OME lift. After talking to several people at the BFGoodrich tent at the Overland Expo West in May and mentioning I might try the BFGoodrich Mud Terrain KM2 they all gave me a version of the same story. They’re all running both the KM2 and the KO2 and trying them both back and forth as well as the new KM3 which is in testing and will supposedly be out sometime in 2018 and, across the board, they all think the KO2 is a better everyday tire that is amazing in many off-road situations. If you do essentially nothing but play in the mud and rock crawl then sure the KM2 has some advantages over the KO2 but they’ve learned a lot from the KO2 and many of those lessons are being incorporated into the KM3. So, if I need new tires before the KM3s are available then the KO2s are going to go on the Tacoma again but in a slightly larger size than stock and maybe Load Range D if I can find them otherwise anything up to and including 33″ versions should fit and perform like these OEM-sized ones have which is, in a word, amazingly.